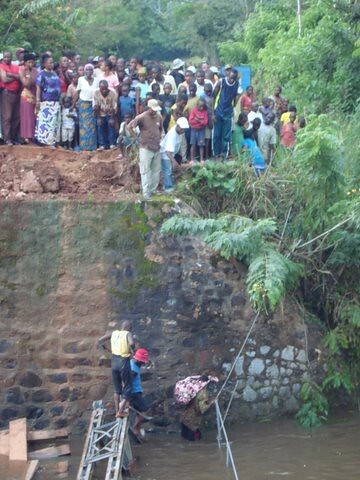 Searching for Bonobo in Congo » Update: Another Bridge Down on the Road through the Okapi Reserve. Barely a month ago, the British government replaced the Bailey Bridge that collapsed over the Ituri River along the RN4. This is the principal road that connects Kisangani in the west to Uganda and Kenya in the east. This road goes through the Ituri Forest, our home for nearly twenty years and the center of the Okapi Reserve. The World Bank funded a much needed rehabilitation of the road, but did not rebuild the bridges. Most of the many bridges have maximum weight limits of 25 tons. Nevertheless, the newly widened, smooth road was too tempting. It seemed to open up Congo’s vast forests with their wealth of wood. This was not a treasure to be ignored by Congo’s largely deforested neighbors, Uganda and Kenya. 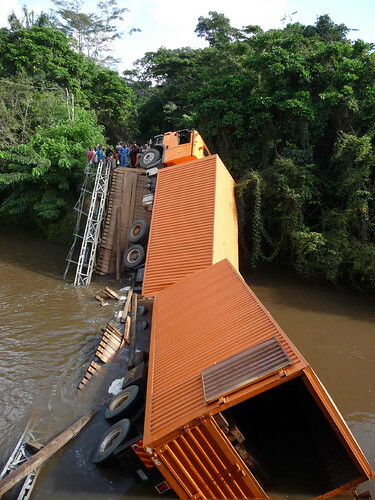 So the bridge over the Ituri went out under the weight of a timber- filled Kenya-bound truck just weeks after that section of the road was opened. The British replaced it. 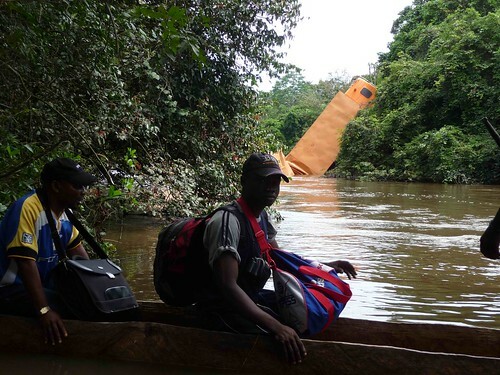 But none of the Ituri bridges were built for major tonnage; one would think that lesson had been learned. Not so. 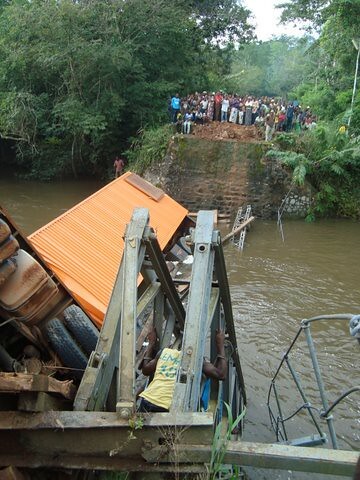 This second bridge went out under the weight of another Kenya-bound truck, again filled with rough-hewn timber. The truck was estimated at over twice, perhaps 3x the weight permissible on the bridge. Now, to cross the river, people clamber down the side of the bridge (above), wade across the submerged sections and scramble up the other side (below). But for now the forest gets a brief reprieve from every-man, chain-saw logging. The first ferries are crossing. Soon there will be big enough dugouts to carry bicycles and motorcycles as well as people. Who’s Illegal Load Busted Congo’s Bridge? This entry was written by Terese Hart, posted on 2009-11-25 at 9:56 pm, filed under uncategorized. Bookmark the permalink. Follow any comments here with the RSS feed for this post. Post a comment or leave a trackback: Trackback URL. fun post – look at those crowds of on-lookers! Dear Terese please provide me the data how I can reach Conrad Aveling (e-mail).